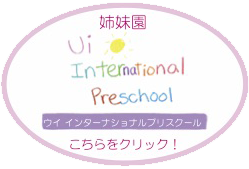 Mission- Nursery Ui was established to aid and support working parents within the community by providing a safe and nurturing environment for their children. As more and more women continue to return to the workplace there has been a greater need for daycares. Therefore Nursery Ui’s aim is to facilitate the working parent by providing around the clock care for children ages 0-8 years of age. Goal- The first goal is to assure a safe and healthy environment for all children who enter Nursery Ui. Second is to awaken and inspire creativity within the child; through fresh, lively and engaging activity using the English language. ●Nursing in English by Native / English speaking staffs. ●90min to Narita Airport, 35min to Haneda airport. ●Close to KABUKI THEATER, TSUKIJI MARKET, TOKYO STATION, and SHIODOME SIO-SITE. ●Able to go to Roppongi, Azabu-Juban, Shinjuku, Asakusa, and Akihabara with in 20min.